Next GDEMU batch will be delayed. 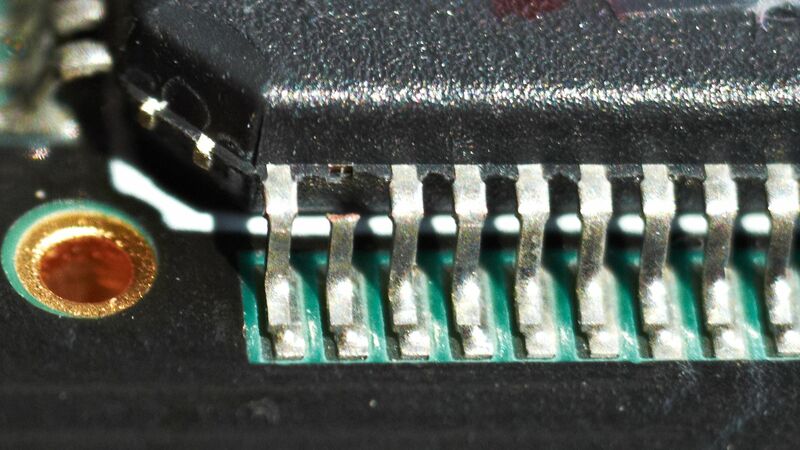 Somehow in our attempt to speed up the production we overstressed the TQFP pins and they cracked. This is the first time I see something like this and quite frankly the exact cause is yet unknown. It could be something related to (too fast?) heating and cooling cycle during soldering. Point here is though the cracks aren’t always so bad as to open the circuit right away and so some devices might seem to work now only to fail due to vibrations during shipping. Below some photos of the issue. 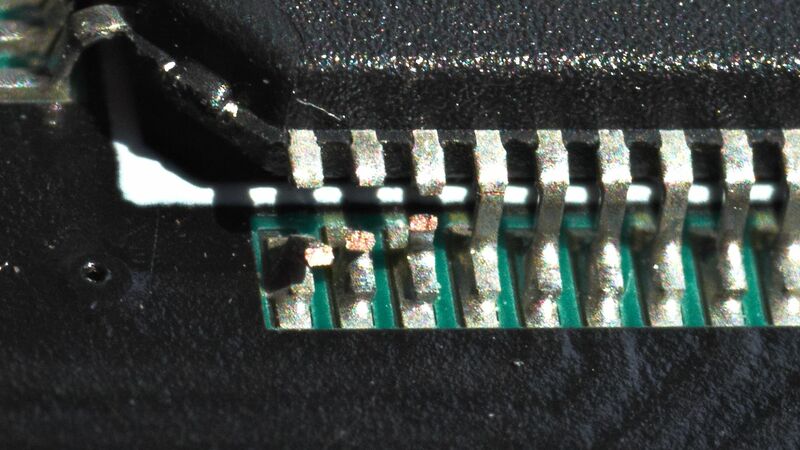 All GDEMUs in this batch that I have ready and tested will undergo another visual inspection, focused on finding these cracks. This is really time consuming though and it’s hard to say how many (if any among the working ones) devices are affected by this. Obviously this is also a lesson learned and hopefully won’t be repeated. In the meantime I will probably have more Rheas and Phoebes for sale, as usual I’ll let you know when the orders are about to open. EDIT: GDEMU problems have been mostly resolved but it took a lot of time, as expected. I will open Phoebe orders on Saturday – Rheas and more GDEMUs will hopefully follow soon. EDIT 2: Phoebe orders open closed. Hopefully almost 24 hours was enough for everybody to get one – but if not, more will come in future. There were so many GDEMU orders (the initial inrush is always very bad) that I had to make a difficult decision. Rather than close orders after 5 minutes and engrage a lot of people I’ve included the units that I don’t yet have – but will, in about 2-3 weeks – in the count. What that means is some of you will have your devices shipped ASAP and some of you will have to wait. As usual give me some time to compile the list and send confirmation emails. In fact I’d like to try something new here as well – rather than email you I’m going to request payment for all the devices that I have ready and ship them once you pay. Do note though that I’m unable to do it all at once, it does take time to prepare the envelopes and pack everything, and print address labels, etc. So it might take a week or so, between your payment and actual shipping taking place I mean. It should end up being faster for everyone though, and less work for me. For the orders that I can’t fulfill right now I’ll send confirmation emails soon. And in case you missed it, Rhea sale will happen tomorrow. UPDATE: Rhea order opened and closed. One would think there aren’t that many VA0/VA1 Saturns owners out there… Well, more will come in few weeks. The big change is here, though it is going through some teething problems of its own so not all is rosy yet. I’ll see if I can manage both Rhea and GDEMU orders at the same time, expect issues. I might change the whole ordering system in near future if all this works out. Quick update: I forgot to mention, more Phoebes and GDEMUs will come soon (few weeks at most).